Like a lot of electric car startups, Rivian has been something of a mystery. With just 560 employees, the Plymouth, Michigan-based company bought a former Mitsubishi factory in Normal, Illinois last year but has kept itself largely under wraps—until now. 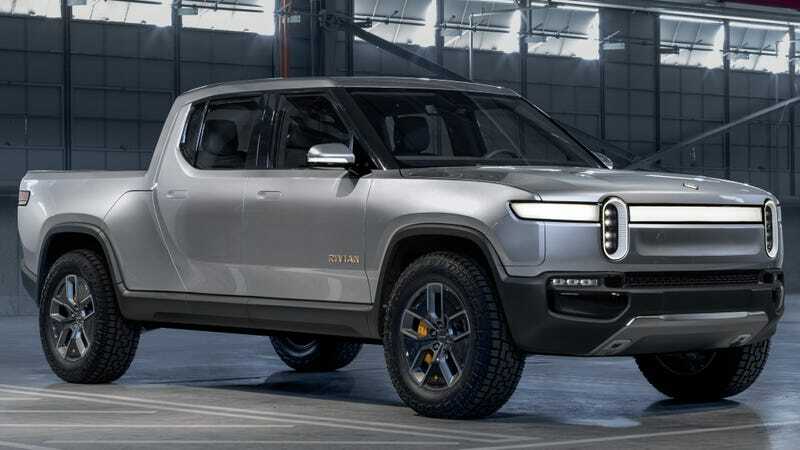 After years of working in the shadows, Rivian is debuting its all-electric pickup truck, the R1T, as well as itself as a company, today on the world stage. And if Rivian can pull this off, it could do for trucks what Tesla did for luxury sedans. So you may be thinking: What the hell is Rivian? While it isn’t coming out of nowhere, it hasn’t exactly tooted its horn much until now, when it plans to show off its wares at this week’s Los Angeles Auto Show. But instead of building hype, Rivian says it’s been building a business, utilizing the expertise of Michigan locals with automotive know-how. And there’s the Mitsubishi factory in Normal, Illinois, with plans to invest over $175 million into the site by 2024, InsideEVs reports. So it’s refreshing, in an age where most startups feel like they run on hot air, to see some rigorous planning instead of just empty promises. My first thought at seeing the fascia of the R1T was that it reminded me of way back when Google was building its own car, only all grown up. Like a nerdy friend you’ve had since middle school who came into their own as an adult, the same round-eyed nerdishness has now morphed into something surprisingly attractive. Admittedly, it looks very concept-ish for now. But behind one of those light bars is a Jalopnik holy grail: a frunk. A glorious frunk that can fit a huge cooler and duffel bag with ease. Rivian’s skateboard-based design (think of it as a battery on wheels) allows for some entertaining use of space and the company takes full advantage of this. There are enough hidey-holes to satisfy even the most accessorized outdoorsy person, including a tunnel storage unit ahead of the back wheels big enough for your snowboard. Plus, the hatch door of that doubles as a seat. The large bed is wide enough to store a sheet of plywood, comes with a cover as well as customizable cross bars and roof rails that owners can move or switch at any time. The bed includes an air pump for bikes as well as an integrated security cable to keep unattended items safe in the bed. Each wheel is powered with a 147kW drive unit, allowing for precise torque control. It also means all of the power and batteries sit below the height of the wheel. This naturally makes for a low center of gravity for Rivian to build up on, perfect for a truck or SUV. All of that torque and power push the R1T from 0 to 60 mph in a claimed three seconds and 100 mph in less than seven seconds. Also, they say it can tow up to 11,000 pounds. Between those wheels can sit several different sizes of battery pack, the largest being a 180 kW battery pack that can reach 400 miles on a single charge and will hit 80 percent battery power in under an hour using DC fast charge. The really interesting claim is this: Charging for 20 minutes lends 100 to 150 miles of range, more than what most people drive in a day. That’s very much on the optimistic end of what we have now with EVs, but it feels attainable. Inside, the truck is roomy and as ready to party as the exterior. The floors are made of tough rubber rather than carpet, and the seats are covered in a tough but soft woven vinyl fabric called Chilewich. The entire interior was built for wiping mud off of while keeping in touch with the modern world. No less than 10 USB charging ports are splayed all over the interior, which also means Instagram will never miss out on your woodsy exploits. The point of this truck is to be both a daily driver and outdoor adventuring vehicle. The R1T comes with off-roading maps pre-programed into its navigation for a reason. Designers and marketers at Rivian point to brands like Patagonia as inspiration for their designs and consumer set. Cliché? Maybe, but also not a bad idea if that’s the audience you want to aim for. Rivian says it wants to prove that an electric car can be tough and rugged as well as environmentally friendly. The truck is designed to be an off-roader, with the giant skid plate undergoing testing similar to ballistic events to make sure the precious battery pack can’t be punctured on rocky roads. And it’s so well sealed up the R1T can wade into a almost a meter of water, despite its low slung battery pack. To keep that battery pumping out the juice, an advanced cooling system is used to keep the cells at the perfect performance temperature, regardless of terrain or outside heat. Adaptive control algorithms learn driver behavior, optimizing user-specific battery management for maximizing battery life, reliability and second-life reusability. Rivian also claims the R1T will come with semi-autonomous tech and all the safety features you’d expect. Rivian says the truck starts at $61,500 after the $7,500 EV tax credit, and that it aims to start deliveries in late 2020. The fully equipped, 180 kWh and 135 kWh battery trucks will begin production first, with other variants to follow, the company says. A base variant with 250 miles of range will come later. Other electric car startups have made lofty claims before, but Rivian wants to prove it’s the real deal. That may a tougher job for this truck than any towing or hauling.